Michelle comes to the local outposts of North America’s original blow dry bar in three styles sourced from Pinot Noir and Chardonnay grapes in Washington’s Columbia Valley. Predominantly a blend of Chardonnay and Pinot Noir, Michelle Brut features delicate flavors of apples and citrus with vibrant acidity. Michelle Extra Dry is a slightly sweeter wine with notes of cream and a toasty finish. 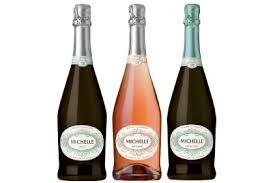 Michelle Brut Rosé is a medium-dry sparkling blush wine made primarily from Pinot Noir grapes, with soft impressions of berries. “We enhanced the cuvées for more body and concentration,” Casqueiro explains. “The wines are elegant, with bright flavors, beautiful structure and crisp acidity.” Michelle’s newly and stylishly dressed as well—in an elegant bottle shape and attractive white label accented with soft blue (Brut, Extra Dry) and blush (Brut Rosé) hues. At her debut, you will enjoy her company in all three cuvées along with: light bites; complimentary dry styles (glitter optional! ); nail files; door prizes; a perfect music mix; and a gift basket raffle benefiting Locks of Love, which has for fifteen years provided prosthetic human hairpieces to children and young adults who have lost their own hair from any diagnosis, disease or accident. http://www.locksoflove.org.